Bring a bubbly touch to the table with this vibrant glassware, featuring Pop Art by Barry Rosenthal. Pop Art meets Barry Rosenthal's signature found objects with a six pack of colorful printed glasses. 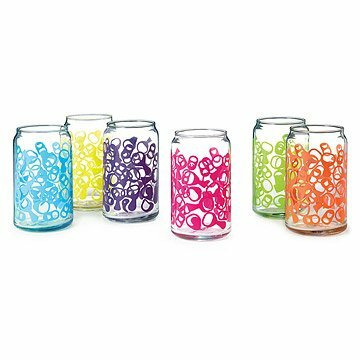 Featuring artfully arranged pop tabs in an array of vibrant hues, this bubbly can-inspired glassware is perfect for giving your morning juice a playful edge, and your post-work brew a familiarly-shaped vessel. Glassware made in New Jersey, decorated in West Chicago, Illinois. Visit the blog to learn how our Product Development team collaborated with Barry Rosenthal to create this uncommon design, or check out our studio tour to go inside Barry's creative space. Barry Rosenthal has lived in New York City for the past 25 years. He studied photography at the Dayton Art Institute in Dayton, Ohio and also studied with notable photographers Emmet Gowin and George Tice at the Apeiron Workshops in Millerton, New York. His fine art images can be found in the permanent collection of the Museum of Modern Art in New York City and the Springfield Museum of Fine Art Springfield, Massachusetts. Barry is a resident of Lower Manhattan, along with his wife and daughter.Check out our studio tour to go inside Barry's creative space. Copyright (c) 2014 - Pop Top Six Pack artwork owned by Barry Rosenthal and licensed to Uncommon Goods LLC. All rights reserved. I bought these as a Christmas/house warming gift to myself. Several months later they look exactly the same as when I bought them and they've been through the dishwasher many times. I needed new glasses and wanted something unique and i just love them! I was worried that the design would wear off when washed but I have not noticed a single chip, smudge or imperfection. I love these! I have had my eyes on these for awhile and finally made the decision to buy them. I like the style of the vessel. I have had them week and the paint is chipping already. They don't look very sharp now! These are wonderful glasses; bright and cheery. I had already purchased this product before, but 6 wasn't enough since I use them daily. Now I have plenty for when company arrives. They're so cute and unique, plus it's easy to tell which glass is yours (unless there are more than 6 people). I use the product daily and have found it great for daily use. It fits perfectly in my smaller hands and the cute design is very attractive. I had some visitors lately and they too commented on how cute the glasses were. I have yet to find a con. Beautiful but only for a week. Love these glasses but the design began coming off after one run through the dishwasher. Love the look and feel of the glasses but to look at them now you'd think we'd used them for years as opposed to the 3 weeks we've had them. These glasses are colorful and fun and the perfect size for daily use. I love the fact that each member of our family of six can use a different color. I've washed them in the dishwasher about 10 times, and so far they've held up fine. As an avid recycler, I have gathered pop tabs for our local Ronald McDonald House's aluminum recycling program for years. I'm known in certain circles as the "pull tab queen," and these glasses are tailor-made for me. I love the bright colors, too! The glasses were a thank you gift for my sister and family after staying with them. She and her two kids were all excited about them when they arrived. The kids insisted they be opened and used immediately. There's just something festive about them. Good gift.